Arytenoidectomy is a permanent and irreversible surgical procedure whereby the laryngeal inlet is widened in its transverse axis, providing a larger airway for respiration. Arytenoidectomy is performed in cases of bilateral vocal fold immobility caused by either paralysis of the vocal cords or their fixation. The first endolaryngeal arytenoidectomy was performed by Thornell in 1948. In endolaryngeal microsurgical arytenoidectomy, the vocal cord is thinned by partial submucosal resection of the muscles and by vertical division of the conus elasticus, which further widens the glottis chink. Additional steps may ensure a favorable outcome, such as hitching the posterior end of the vocal cord to the vestibular fold, using tissue glue instead of sutures to close the surgical defect, and excision of the arytenoid with laser. Arytenoidectomy can be performed endoscopically by conventional cold steel microsurgery or with the use of laser; currently, the latter is the more popular approach. [7, 8, 9] Arytenoidectomy can also be done by an external or open method if laser is not available, if previous endoscopic or microsurgical procedures have failed, or in cases for which access to the area is limited by anatomical distortions. Prior to the advent of arytenoidectomy, recurrent laryngeal nerve anastomosis was performed. However, it is not possible to precisely reunite the fibers of the antagonistically acting adductor and abductor muscles because they run in the same nerve bundle. Therefore, the results of this surgery were poor. External lateral fixation of the vocal fold may be done as a temporary or stop-gap measure if future restoration of normal function is possible. This approach can be used if there is mucosal cover present over the posterior glottis. However, this approach has several problems, including the need for definitive treatment, failure due to the suture cutting through the tissues, inadequate widening due to splintering of the arytenoid cartilage if the conus elasticus is not divided at the same time, granulations and formation of scar tissue, and poorer voice quality than can be expected after arytenoidectomy. Hence, external lateral fixation is now largely outdated and arytenoidectomy is preferred. Patients with paralysis or immobility of the vocal cords usually are treated with tracheostomy as a temporary or emergency measure. Patients who are deemed fit for decannulation may be considered for arytenoidectomy. Absolute contraindications to arytenoidectomy include aspiration and/or the presence of progressive neurological disease. Relative contraindications are compromised pulmonary status, uncontrolled diabetes mellitus, and previous radiation therapy. Particular attention must be given to patients having unrealistic expectations from the procedure. The reluctance of the patient to accept a poor voice quality in lieu of a better airway, possible noncompliance with multiple procedures to stagger the surgical trauma and optimize the vocal outcome, and failure or unwillingness to adhere to rehabilitative measures such as speech therapy should be considered as relative contraindications. Patients with a tendency to form keloids or hypertrophic scars are not ideal candidates for arytenoidectomy; external laterofixation is a better option for them. Age is not a contraindication to corrective surgery. The vocal cords are composed of mucous membrane infoldings that stretch horizontally across the middle laryngeal cavity. They are attached anteriorly at the angle on the interior surface of the thyroid cartilage and project posteriorly to the arytenoid cartilages on either side. The thyroarytenoid muscles function to draw the arytenoid cartilages forward, thereby relaxing and shortening the vocal cords, while also rotating the arytenoid cartilage inward, thus adducting the vocal folds and narrowing the rima glottis. The vocalis part of each thyroarytenoid muscle is contained within the vocal folds on each side. See the image below. 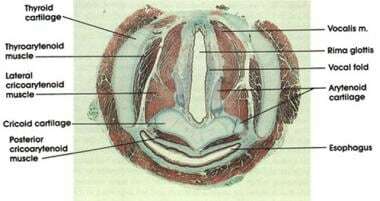 Cross-sectional histological anatomy of the vocal cord. Image courtesy of anatomyatlases.org. For more information about the relevant anatomy, see Vocal Cord and Voice Box Anatomy. The optimum timing for performing arytenoidectomy is 1 year after onset of bilateral vocal fold immobility or paralysis; it should never be performed in the first 6 months after onset. However, when both the recurrent laryngeal nerves are divided at primary surgery for thyroid carcinoma, arytenoidectomy can be done as a primary procedure. Carbon dioxide laser precautions are implemented and saline-soaked pledgets are placed in the subglottis to prevent disruption of the endotracheal tube cuff. The application of topical mitomycin C (0.5 mg/mL) to the wound for 5 minutes is an optional adjunctive treatment in an attempt to decrease fibroblast formation and scar tissue at the operative site. At the end of the procedure, 4% lidocaine spray can be used to minimize postoperative laryngospasm. Honest and intensive preoperative counseling is the most important step prior to arytenoidectomy. Correctly identifying the cause of bilateral vocal fold paralysis or immobility is critical in guiding treatment and shaping the expectations of both the patient and surgeon. The aim of treatment is to improve the airway while minimizing adverse effects on the voice. At the same time, the patient must understand fully the limitations of the procedure in restoring the voice and must be prepared to accept a poor voice quality at all costs; this fact must be well documented in the preoperative records. Advantages and disadvantages of both arytenoidectomy and tracheostomy should be discussed with the patient in a sympathetic manner, as glottic enlargement after arytenoidectomy is irreversible. If bilateral vocal fold paralysis is longstanding, chronic hypoxia may have caused obesity. Obese patients must undergo weight reduction before the procedure. Preoperative investigations should follow a detailed history and physical examination of the patient. Preoperative pulmonary function tests and radiographs of the trachea are absolutely mandatory. If tracheal stenosis is present, it must be dealt with before arytenoidectomy. Otherwise, this would additionally cause the loss of the patient’s voice while leaving the patient dyspnoeic with a tracheal stenosis. Laryngeal electromyography (EMG) of both the right and left thyroarytenoid-lateral cricoarytenoid muscle complexes is done to determine the cause of bilateral vocal cord immobility. In case of bilateral vocal cord paralysis, evidence of neurological damage will be present and the prognosis regarding recovery can also be established. If there is any hope of return of normal function, as suggested by the EMG, arytenoidectomy should be avoided or postponed. In case of asymmetric paralysis, arytenoidectomy can be done on the worse or completely paralyzed side. The vocal cord with better muscle tone and better neurological status can retain function and help to improve the vocal outcome after surgery. The EMG must be evaluated with discretion as movements in the region of the arytenoid cartilage can be affected by the motor fibers of the superior laryngeal nerve that supply the ventricularis muscle and the small muscle in the aryepiglottic fold, which can be mistaken for an incomplete paralysis. In bilateral vocal fold immobility due to cricoarytenoid joint fixation and/or in posterior glottic stenosis, the laryngeal EMG will be normal. The cricoarytenoid joint must be manually palpated, either in the office setting under local anesthesia or in the operating room under general anesthesia. When both the joints are found to have impaired or no movement, arytenoidectomy must be performed or the worse or more rigidly fixed side. Imaging studies in the form of contrast-enhanced computerized tomography and/or magnetic resonance imaging scans should incorporate the skull base, neck, and upper part of the chest to try to identify the cause and site of the lesion, which could be in the cortex, brain stem, or the vagus and recurrent laryngeal nerves. Contrast-enhanced computed tomography with fine cuts or high-resolution computed tomography through the larynx may further delineate cricoarytenoid joint abnormalities and determining the extent of posterior glottis stenosis, if any. Arytenoid dislocation or subluxation can be identified as well. Cerebrovascular accidents, congenital malformations, or space-occupying lesions may be observed on brain magnetic resonance imaging. Swallowing studies must complete the investigative workup of the patient. If aspiration, dysphagia, or cricopharyngeal spasm is found, appropriate preoperative corrective steps must be taken and tracheostomy may be a better option if deglutition is impaired or unremediable. Arytenoidectomy is done under general anesthesia with endotracheal intubation, mostly using carbon dioxide laser. The patient is placed in the supine position for microlaryngeal surgery, with flexion at the neck and extension of the head. This is achieved by placing a head ring under the patient’s head, lifting up the chin, and not placing any sandbags under the shoulders, which produces the so-called elevated vector position for laryngeal surgery. The suspension laryngoscope is then fixed to the patient’s chest. Observation is mandatory up to 24 hours, whether laser is used or not. If laser is not used, preoperative tracheostomy must be done because the incidence of bleeding is greater. Apart from that which occurs with the incision, bleeding can also occur from the superior laryngeal artery at the depth of the wound after the arytenoid cartilage has been removed. If this bleeding is severe, the patient must be reintubated, the trachea packed, and the superior laryngeal artery ligated by external exposure through a neck incision. Medications include those given for pain relief, prophylactic antibiotics, and most importantly, antireflux drugs such as proton-pump inhibitors. The last group of medicines may be given for up to 8-12 weeks to reduce the risk of granulations forming over the operative site. These may lead to narrowing and restenosis, and thereby to recurrence and surgical failure. Hydration and nutrition must be maintained. Patient instructions on care of the tracheostomy are essential in cases for which tracheostomy was required or was preexisting. Voice rest is not advised. The patient should be cautioned that the voice becomes worse and more breathy in the immediate postoperative period due to the wider glottis on the operated side and diffuse postsurgical edema that interferes with vocal fold movement on the nonoperated side. The importance of regular follow-up and office visits must be stressed to the patient. Postoperative sequelae such as granulomas are more common with cold steel surgery and are usually not difficult to manage. Small granulomas are usually coughed out by the patient, but the larger ones must be removed, usually in the outpatient setting under local anesthesia. A mild notched scar develops at the operated site and is not of significant concern. Decannulation should be gradual and may take 6-8 weeks depending on the patient profile. Postsurgical edema may persist for weeks and may be substantial with the use of electrocautery. After a week or two, the tracheostomy is corked. The patient should be encouraged to climb stairs and subsequently decannulated if this exertion is tolerated. Gradual or staggered decannulation is carried out for patients who are apprehensive and anxious. Speech therapy is instituted and must be religiously followed after the wound has healed completely. Voice usually becomes better over 2-3 months. Thereafter, further improvement is unlikely. Late sequelae are seen in some patients who may develop a mucosal edema resembling Reinke edema on the nonoperated side several years after the surgery. This can be removed with a lateral microflap or by stripping. Laser arytenoidectomy has very few complications if proper case selection and postoperative care have been instituted. However, arytenoidectomy is an irreversible procedure and cannot be undone at a later stage. Overenthusiastic resection therefore is not warranted and a staged approach is advocated. Total arytenoidectomy may be done as a single-step primary procedure only in highly selected cases and always unilaterally. Intubation is done with a 5.0 or 5.5 laser-safe endotracheal tube if a preexisting tracheostomy is not present. The laryngoscope is suspended and angled toward the operative side. Usually, the endotracheal tube can be placed in the posterior glottis to allow exposure of the vocal process on the side to be operated. Alternatively, the endotracheal tube can be placed anterior to the laryngoscope or jet ventilation can be used. For transverse cordotomy, the location of the vocal process is confirmed and an incision is made just anterior to it. The arytenoid cartilage should not be exposed as far as possible so that granuloma formation is avoided. The entire width of the true vocal fold must be cut so that it is fully separated from the vocal process. The medial 3-4 mm of the false vocal fold may also be included to ensure adequacy of the release. Endoscopic evaluation with a 30-degree telescope should confirm that the cordotomy is flush with the wall of the subglottis laterally. For medial arytenoidectomy, the most medial 2-3 mm of the body of the arytenoid cartilage is removed in order to widen the posterior glottic airway. The vocal process and intra-arytenoid mucosa are not disturbed. The amount of arytenoid cartilage that is removed depends on the extent to which the airway is narrowed. This may be done in multiple sittings so that the impact on the voice is minimized and the patient gets acclimatized to the procedure. It also allows for the feasibility of performing a similar conservative procedure on the opposite side. The initial steps for total arytenoidectomy are similar to those taken with the medial arytenoidectomy. Continuous carbon dioxide laser ablation of the entire body of the arytenoid is achieved by removing cartilage until the defect is flush with the wall of the cricoid ring posteriorly and laterally. Widening beyond the limits of the cricoid ring is not necessary. The enlargement is confirmed with a 70-degree telescope. For open arytenoidectomy, an anterior laryngofissure or a lateral thyrotomy approach with resection of the posterior rim of thyroid cartilage and elevation of the piriform sinus mucosa may be used to expose and remove the arytenoid cartilage. Bosley B, Rosen CA, Simpson CB, McMullin BT, Gartner-Schmidt JL. Medial arytenoidectomy versus transverse cordotomy as a treatment for bilateral vocal fold paralysis. Ann Otol Rhinol Laryngol. 2005 Dec. 114(12):922-6. [Medline]. Ossoff RH, Karlan MS, Sisson GA. Endoscopic laser arytenoidectomy. Lasers Surg Med. 1983. 2(4):293-9. [Medline]. Crumley RL. Endoscopic laser medial arytenoidectomy for airway management in bilateral laryngeal paralysis. Ann Otol Rhinol Laryngol. 1993 Feb. 102(2):81-4. [Medline]. Thornell WC. Intralaryngeal approach for arytenoidectomy in bilateral abductor paralysis of the vocal cords; a preliminary report. Arch Otolaryngol. 1948 Apr. 47(4):505-8. [Medline]. Danino J, Goldenberg D, Joachims HZ. Submucosal arytenoidectomy: new surgical technique and review of the literature. J Otolaryngol. 2000 Feb. 29(1):13-6. [Medline]. Sato K, Umeno H, Nakashima T. Laser arytenoidectomy for bilateral median vocal fold fixation. Laryngoscope. 2001 Jan. 111(1):168-71. [Medline]. Szmeja Z, Wójtowicz JG. Laser arytenoidectomy in the treatment of bilateral vocal cord paralysis. Eur Arch Otorhinolaryngol. 1999. 256(8):388-9. [Medline]. Al-Fattah HA, Hamza A, Gaafar A, Tantawy A. Partial laser arytenoidectomy in the management of bilateral vocal fold immobility: a modification based on functional anatomical study of the cricoarytenoid joint. Otolaryngol Head Neck Surg. 2006 Feb. 134(2):294-301. [Medline]. Plouin-Gaudon I, Lawson G, Jamart J, Remacle M. Subtotal carbon dioxide laser arytenoidectomy for the treatment of bilateral vocal fold immobility: long-term results. Ann Otol Rhinol Laryngol. 2005 Feb. 114(2):115-21. [Medline]. Yilmaz T. Endoscopic total arytenoidectomy for bilateral abductor vocal fold paralysis: a new flap technique and personal experience with 50 cases. Laryngoscope. 2012 Oct. 122(10):2219-26. [Medline]. Yilmaz T, Süslü N, Atay G, Özer S, Günaydin RÖ, Bajin MD. Comparison of voice and swallowing parameters after endoscopic total and partial arytenoidectomy for bilateral abductor vocal fold paralysis: a randomized trial. JAMA Otolaryngol Head Neck Surg. 2013 Jul. 139(7):712-8. [Medline]. Aubry K, Leboulanger N, Harris R, Genty E, Denoyelle F, Garabedian EN. Laser arytenoidectomy in the management of bilateral vocal cord paralysis in children. Int J Pediatr Otorhinolaryngol. 2010 May. 74(5):451-5. [Medline]. Misiolek M, Ziora D, Namyslowski G, Misiolek H, Kucia J, Scierski W, et al. Long-term results in patients after combined laser total arytenoidectomy with posterior cordectomy for bilateral vocal cord paralysis. Eur Arch Otorhinolaryngol. 2007 Aug. 264(8):895-900. [Medline]. Reidenbach MM. Anatomical bases of glottic widening surgery related to arytenoidectomy. Clin Anat. 1999. 12(2):94-102. [Medline]. Worley G, Bajaj Y, Cavalli L, Hartley B. Laser arytenoidectomy in children with bilateral vocal fold immobility. J Laryngol Otol. 2007 Jan. 121(1):25-7. [Medline].